The latest LTE vs. WiMax tests can't be good for Sprint's morale. Analyst firm BTIG Research ran more than 1,000 speed tests in New York City to determine which 4G network was faster, Verizon's LTE or Sprint's WiMax. According to Boy Genius Report, BTIG's 4G deathmatch had two smartphone combatants: Sprint's HTC EVO 4G running on WiMax vs. Verizon Wireless' HTC ThunderBolt on LTE. BTIG analyst Walter Piecyk and his team of testers found that Verizon's LTE was dramatically faster and more reliable. Average LTE speeds were 9Mbps downstream and 5Mbps up. WiMax was downright poky by comparison: About 1Mbps both downstream and up. 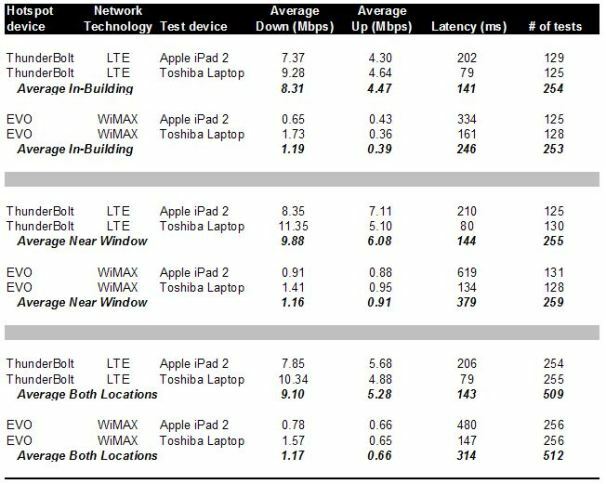 BTIG's LTE-vs.-WiMax findings are similar to the recent Big Apple test results of our sibling publication, Computerworld . CW contributor Brian Nadel says Verizon LTE's download and upload speeds were significantly faster than those of Sprint WiMax. "When I tested Sprint's WiMax network in 10 locations in and around New York City, I was mighty impressed. I recorded a peak download speed of 11.2Mbit/sec., with an average of 4.1Mbit/sec.--about seven times faster than Sprint's 3G service in the same areas." These tests are specific to one city, of course, and WiMax may perform better elsewhere. But Sprint, the third-place U.S. wireless carrier behind Verizon Wireless and AT&T, can't afford to be saddled with a slowpoke 4G network that can't keep up with LTE. Not surprisingly, Sprint has revealed plans to migrate to LTE in the near future. At Mobile World Congress in February, Sprint executive Bob Azzi told PCWorld's Mark Sullivan that the carrier is planning to build an LTE network that would complement, not replace, Sprint's existing WiMax system. The sooner Sprint embraces LTE, the better. Assuming AT&T's proposed $39 billion takeover of T-Mobile USA is cleared by U.S. regulators, Sprint will have a tough time competing against its much larger competitors. Trying to do so with a slowpoke 4G network would be the kiss of death.